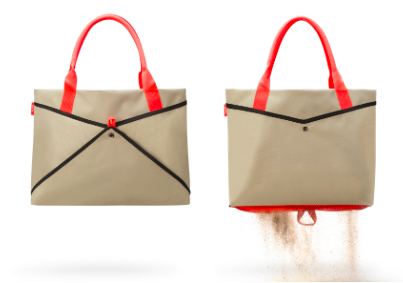 Can you guys imagine coming home from the beach with no sand in your bag? It seems like something pretty impossible, right? I know that we head to the beach and I’m finding grains of sand inside of things that didn’t even go to the beach that day for weeks on end. 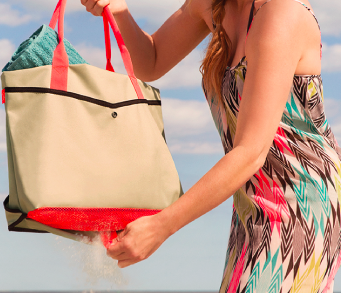 Introducing the Quirky Shake Beach Tote. Invented by celebrity chef Spike Mendelsohn and Charlie Dougiello, this bag design is all kinds of ingenious. The bottom of the bag is mesh, only you can’t see it because it’s inside of the bag. It’s covered by a removable flap. Basically, when you are ready to leave the beach, you flip the flap up, shake, and all the sand that’s lodged itself at the bottom of your bag shakes out. Love it, right? It’s a cute design too! Get the Quirky Shake for $39.99 on Quirky.com.